Nagarjuna´s argumentation leads to the thought about that human beings have two aspects: an energy aspect and a consciousness aspect. Seen from the energy aspect lawfulness rules: your body is subject to the physical laws of nature, your psychic system is subject to the lawfulness of the energy fields and of the energy transformations. The energy aspect is the area of compensatory karma; it is the area of experiences, the area of the personal and collective images of time, which work in sequences in past and future, and therefore in absence of awareness, or absence of consciousness. And that also means that it in itself is without realization. So, the energy aspect of human beings (compensatory karma) is closely related to the material world, laws of nature, cycles of life, yes actually pure causal regularity of mechanical kind (also read the chapter The Lifeartist as a Natural Being in my book A Portrait of a Lifeartist). In accordance with the authentic spiritual traditions the movement of time is a power, an expression of energy, which follows some laws. These laws are also called compensatory karma. I use this concept because the concept of negative karma also has been distorted by the positive psychology movemement (into what they call the law of attraction). A cycle can last from some hours to some years. There are big cycles and small cycles within the big ones. The cyclic nature of the Universe is closely connected with the impermanence of all things and all situations. Buddha made this into a central part of his teaching. It is also a central part of the teachings of Nagarjuna, which you can read about in my article A critique of Ken Wilber and his integral method. Seen from the consciousness aspect, though, then a human being seems to be akin to the wholeness, to be transcendent in relation to these lawfulnesses. The consciousness is the area of progressive karma, spiritual development; it is the area of realization, the area of the universal images of time, which work in synchronism with the Now. The Now seems to be a quality of awareness, and therefore also of consciousness and wholeness. Realization has to do with the three states the wholeness can be in: sleep, dream, awake. So it is only here you can talk about the spiritual insights of the great mystics. It is only here you can talk about genuine mystical experiences; that is: experiences, which are followed by realization. The concept of karma has therefore primarily to do with the development process of your spiritual essence - and only secondary and indirectly with the Ego´s process; that is: with your personal time and lifesituation, or with the collective time and lifesituation. Admittedly it is the Ego´s actions out on the scene, which leaves karmic tracks. 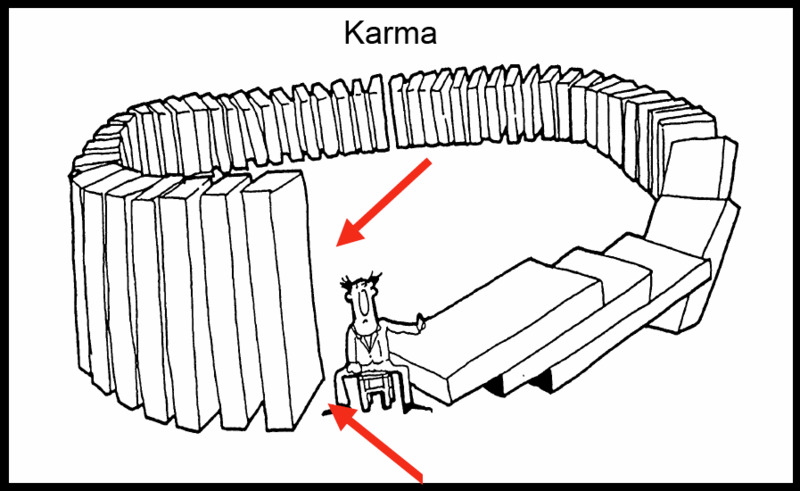 Karma (compensatory karma, or negative karma) is the subconscious consequences of the Ego´s actions. Each time the Ego acts - and thereby changes the balance in the wholeness – then the structures and power lines in your spiritual essence changes, in the subconcious. When your spiritual essence is sleeping, karma is automatically. The Ego´s pendulum swings in one life out in an extreme. Hereby gathers in the wholeness, in your spiritual essence, momentum to, that the pendulum in a future life will swing out in the opposite compensatory extreme. This is the automatic compensatory karma. In one life ascetic, in the next libertine, then inhibited and expelled, thereupon sybarite etc. with no end, because the Ego has freedom continual to give new momentum and new course - within the karmic possible; that is to say: heredity and environment - to the Ego´s pendulum (the same is happening in numerous other ways within one life). That is one reason for that nobody can tell you about your karma (about free will and heredity and environment: read my article The pseudoscience of reductionism and the problem of mind). However when the Ego decides to use its free energy, its existential option to begin to awake, then the karma structures changes. Then you begin to use and work with your spiritual dimension. This dimension is not subject to the karmic structure, it is it, or it is over it. The wholeness is over, is transcendent, in relation to the laws and mechanisms, which regulate the infrastructures of the wholeness. The wholeness is not subject to the laws and energy transformations, which rule between the constitutive parts of the wholeness. When your spiritual essence begins to dream, when the Ego-consciousness begins to bloom, to open itself, you discover the karmic lawfulnesses and can therefore relate to them. When your consciousness in extended state begins to sense the karmic structures, which after all not only rule between the many life´s of your spiritual essence, but all the same are known psychological mirrored from the Ego´s dreams and the Ego´s life - then you can change attitude. Note, that your thoughts (the mind) belong to the energy aspect, and not the consciousness aspect. I say this because they in the very popular movement of New Thought, Law of attraction and positive psychology, have confused the consciousness with the thoughts. They here think that you can produce progressive karma (what they call the law of attraction), with your thoughts. You can´t, because that is not an awakening proces. Actually it would just produce more compensatory (negative) karma. It is only the spiritual awakening of your consciousness, and its direction in towards the source, the form of consciousness, that will produce progressive karma (see my article The New Thought movement and the law of attraction). Human beings are in that way, seen from the point of view of the ordinary ego-consciousness, inserted in two dimensions: a continuum, which streams are subject to laws; a discontinuum, for which leaps laws not seem to be effective. Note though, that this must not be confused with any quantum mystical theories about quantum jumping, quantum healing, time travel, etc., etc. As I have shown in my articles Quantum mysticism and its web of lies, and Quantum mechanics and the philosophy of Niels Bohr, then laws are still effective within quantum mechanics. Quantum mechanics, no matter how weird it is, belongs to the energy aspect of human beings. The wholeness, your spiritual essence, is normally the discontinuous aspect; normally, because this is of course seen from the point of view of the ego-continuum. Seen from the point of view of your spiritual essence, then the ego-continuum, with its sleep and awake, life and death, is the discontinous aspect, and the spiritual essence the continuous aspect. But the parts, the Ego and its evaluations, is normally the continuous aspect. Concerning the progressive karma it applies, that each new life, in a quintessence, repeats the crucial stations on the development path of the spiritual essence. The place, where you can find your own progressive karma, if such is available, is therefore in the life, you have lived, in the history of your present life. It lies as an invisible script underneath the history of your actual life. It is the dream-tracks and songlines in the artwork of your life. There is no doubt about, that Karen Blixen, though not fully conscious, had a sense of this map. All her books are about destiny seen in this way; they are about people who either live in accordance with this map, or in discordance with it. This map, this universal image was, what she referred to as the ”ancient”, the ”original”, and which she always was seeking as authenticity, autonomy, possibility, freedom and adventure. And a universal image is of a holographic nature, therefore it contains all other images, personal, collective and universal, and therefore it contains the dream-tracks and songlines in the artwork of your life. It is the universal history of the astral plane; the Akashic records, or the wholeness, which is awake (see my article The philosophy of Karen Blixen). Alaya-vijnana is a term used within Yogacara Buddhism to indicate the store-house consciousness, or the great vision, which consists of universal images. It is also called the Akashic records. These universal images are a kind of energetical mandala-structures or yantra-fields. They have a linguistic nature, but it is of a visionary kind. These images are composite by sound and color, symbol and structure. You could also say, that they are what the philosophers call unmoved matter, a worldaspect of sound-colours and symbol-structures, an ocean of vibrant, soundfilled energyfields, which shimmer in symbols and colours. Altogether filled with information about life. Together the great vision, an information-ocean of holographic nature. We have historical records about this vision. For example there within Tibetan Buddhism exists a peculiar doctrine about the so-called Tertöns (tib. Gter-bston - the unearthers of the hidden books), people who are born with a special karmic connection to a long ago deceased master, and who, because of the connection to this master´s oneness-consciousness with the universal vision, now can collect treasures of information in from the vision, or the universal images, which after all work in synchronism with the Now, and which therefore lie in the wholeness, in the continuum of eternity. The master was hiding and storing holy “texts” various places in the universal images with that purpose, that a future "Tertön" would be able to find this knowledge again, decipher and publish it. Within the New Age movement there are countless people today, who work egoistic with karmic experiences – that is to say: they earn money as clairvoyants, regression therapists etc. Some of them live on pure make believe, others are direct frauds, but some of them have actually the ability to see into the collective time and its images, and tell about a past and a future which lies outside the area of the personality. But usually they have no philosophical training, no realization training and ethical practice. Therefore they basically do not know what they are doing. They are lost in the area of time where mountains no longer are mountains, and woods no longer are woods. There is in this area of the collective time and its images, with all its “experts” and clients, the possibility for a lot of waffle, a lot of imprecisely guesses and imagination, fiction and speculation (see my article Six common traits of New Age that distort spirituality). There are therefore some philosophical principles you ought to hold on to, on the whole of this enourmous, and growing market. The so-called compensatory karma will by these experts and clients normal be misunderstood and abused as a kind of legitimation of, that we are as we are or do, as we do. He or she becomes obliged to do this or that in order to equalize old karma, or because it is his “destiny”. He is being told that he is going to meet certain people, are being told about other people, etc., etc. All this is spiritual seen nonsense. Usually the whole thing is about escaping from reality or excuses. It all origin from the collective time, which work in sequences in past and future, and therefore, in deeper sense, not karmic and not in the least spiritual. If a human being in genuine sense experiences (that is: realizes) compensatory karma, then this will precisely cause a separation, a break in relation to the automatical identification with tendencies and circumstances. A human being, who actual realizes its karmic conditions, will precisely, by force of realization, break the automatic process. Another philosophical principle is to examine, whether the karmic talk and experiences of the “experts” and clients remove their energy-investments in the actual reality. If focus is displaced backwards or forwards in time, then the collective time has taken over and spiritual seen there therefore happens an escape. Such an escape is seen both in Freud, Rank, Grof, Janov, rebirthing, regression (see my article Regression psychotherapies). None of these people and theories can therefore be said to work spiritual. If you namely use the karma idea in that way (the idea of a person´s spiritual destiny), it is no longer a spiritual help, it is a collective displacement of the focus backwards or forwards in time and therewith out of reality and into the unreality of the collective time. The genuine karmic structures do not lie in the collective time, but in the universal time, which work in synchronism with the Now. If the karma idea is used spiritual seen correctly, then the focus, instead of being projected out in something afar (past lifes, a guru, birth, the future), will be present in something very near, namely only in the most intensive experiences of this actual life, and after that: in this actual Now with its possibility of realizing your innermost. It is your awareness in the now that will find the progressive karma, and this awareness you can of course only practise yourself. So the universal images lie as a kind of dream-tracks and song-lines in your actual life here and now. Only here and now they can be discovered. They can manifest themselves in symbols, which contain informations about the development process of your spiritual essence. Informations from the universal images are, contrary to informations from the collective images, not contradiction-filled and split, but healing and synthesizing (see my article Paranormal phenomena seen in connection with mystical experiences). They are the map, which shows the path from the Ego to your spiritual essence. When they have been discovered, the Ego knows the way to the pure awareness and love of its spiritual essence – the home of the spiritual essence. Only Man himself can find the progressive karma (his spiritual destiny; the dreamtracks and songlines in his spiritual journey; the map that shows his way to enlightenment). The consciousness has the key in its life. It helps nothing, what people through a system may be able to think about the collective time, or fantasize about karmic experiences and spiritual evolution. Nobody can tell you about your karmic structures, or your spiritual evolution (or the world´s spiritual evolution), or what will happen if you use their techniques. All people, models or techniques - clairvoyants, regression therapists, astrologers, shamans, channelers, Ken Wilber´s integral method, Holotropic Breathwork, Human Design system, Law of attraction etc., etc., etc. - who are claiming they can help you karmacial – that is: with your spiritual growth - are cognitional and ethical delusional and deceptive. In my article Humanistic psychology, self-help and the danger of reducing religion to psychology, I show the consequences of the very popular self-help idea, that you psychological can control reality as you want, and therefore the concept of karma. In my article The New Thought movement and the law of attraction, I show how the concept of karma here has been distorted so that it fits with self-centredness. In my article James Arthur Ray and the sweat lodge tragedy, I show a concrete example of how compensatory karma strikes back when you abuse the concept of karma in an egoistic way. Only your own realization opens. Whether another person even was able to read the whole of the karmic course (a person´s life-history, destiny) and tell the seeker about it, it would not help. On the contrary it would harm. Only your own inner experience and realization can open the spiritual dimension. Karma in other ways is nonsense. And by the way, that´s the same with all spiritual. That is the other reason for why nobody can tell you about your karma.